One of our primary jobs is to help our clients look good—and it’s nice when a client’s efforts are recognized in their field. Bull Moose Tube, a client based in the St. Louis area, is a leading manufacturer of steel tubing for architectural and mechanical applications. 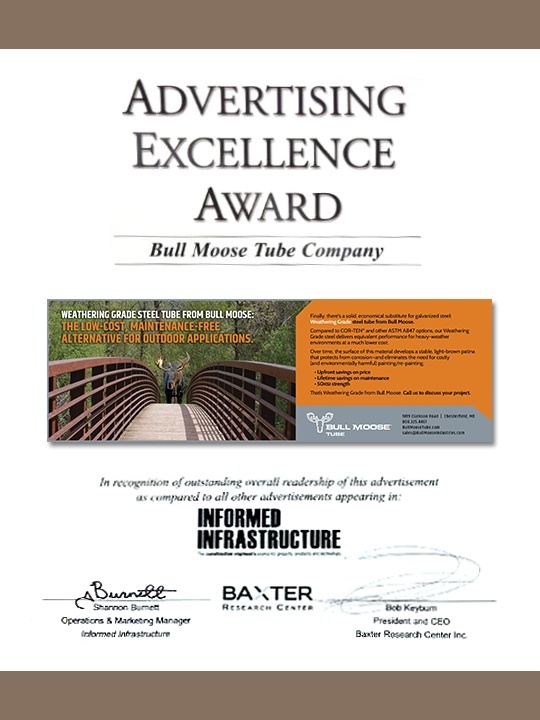 Recently, Bull Moose earned an Advertising Excellence Award for their print ads in Informed Infrastructure magazine, based on readership and retention of those ads. Given what a tough audience readers of technical journals can be, we’re grateful that Bull Moose allowed us to craft ads that got their attention.